Justice League is slated for 2017. It has plenty of time to be cancelled. I guess it will depend on how well Batman vs Superman/Man of Steel 2 does. Saddam should star in this movie as Batman, Superman, and all accompanying characters. It looks like batman let one go. Incorrect. Ben Affleck's kryptonite is doing movie's that do not take place in Boston. He will be terrible. qft, except I'd change it to "movies that he is not writing or directing". Pretty much everything he did with Matt Damon was really good...but most of those were in Boston...so point still holds. Someone added a touch of color. God I would love for it to be like this. But of course itll just be boring ol' jet black again. I said it that way because although I thought Argo was a good movie (good not great), I thought he was mediocre at best. I can appreciate a character who is not demonstrative, but his CIA agent was apparently the same person at the end of the story as at the beginning and that, I cannot tolerate from an actor. 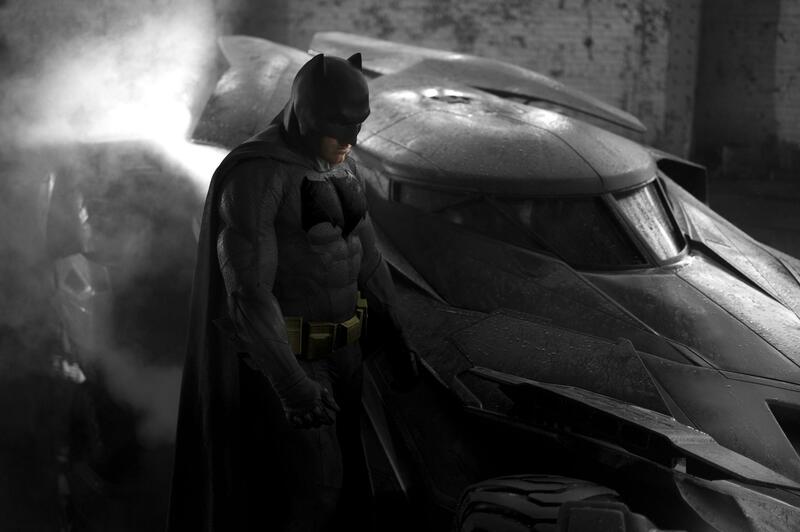 Affleck is gonna have to munch some roids to get that big, Batman is gigantic in that picture. Affleck was jacked in "The Town". It won't be that hard to get back there, he is a big dude. Supposedly he's been putting on a good amount of bulk. He's pretty cut in that last movie he wrote I think. I've always loved the blue/gray Batman designs. Something about it, idk. Also here's another recolored pic with a black palette. Maybe that bat on his chest should lay off the 'roids. This one looks like he glued a paper bat to his chest.